I ordered a train with coal to the station the player is standing. steinio wrote: I ordered a train with coal to the station the player is standing. The problem is that you have Loader Redux cargo wagon integration enabled, which is Lua scripting that affects all loaders, even those from other mods. The Miniloader inserters are filtering properly once I set Mod Settings->Map->Loader Redux->Use cargo wagons->disabled. Oh damned. Thanks for your investigation. Maybe this is also the reason for the upgrade planer crash. steinio wrote: Oh damned. Thanks for your investigation. Maybe this is also the reason for the upgrade planer crash. The error you're getting suggests that somehow there were N items on the miniloader's belt before the upgrade, but there wasn't enough room on the new miniloader after the upgrade for those same N items. I'm not sure how that could happen. Is this reproducible in the save you already posted? No, sorry i upgraded them manually in the meantime but detected a wrong wire connected to some of the miniloaders. I can try to make some tests and rebuild the situation. Research missing filter miniloader for ultimate Belts. Darkestnoir wrote: Research missing filter miniloader for ultimate Belts. Therax wrote: Filter miniloaders for these speeds are disabled, and circuit control is broken. 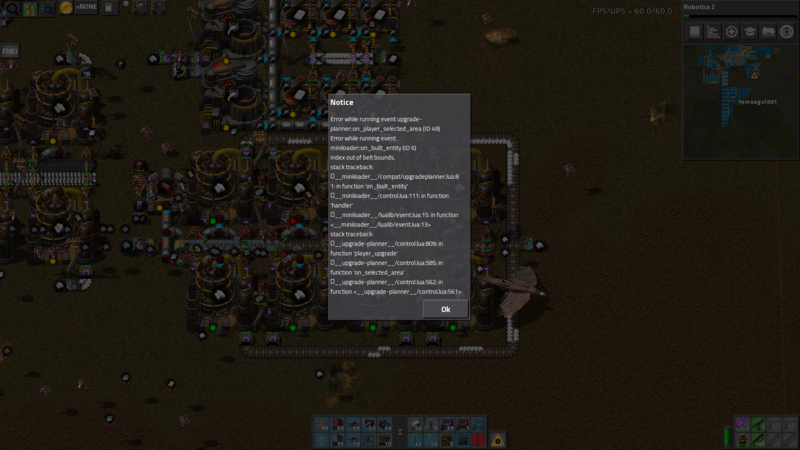 As described earlier in the thread, due to Factorio engine limitations, inserters and Miniloaders face severe problems operating at the speeds of Ultimate Belts. anyone else experiencing crashes when you try to upgradeplanner miniloaders? Make a temp blueprint of the area. Upgrade this blueprint in upgrade planner. Then deconstruct the loaders and place the blueprint again. This saves at least some work for redoing filters and circuit conditions. smeagol001 wrote: anyone else experiencing crashes when you try to upgradeplanner miniloaders? This is the same crash steinio reported. Basically what happens is that Miniloader removes all the items from the belt and stores them in a special chest, then upgrade-planner replaces the miniloader, and then Miniloader tries to put the items back on the belt. All this happens in the same game tick, but somehow, there sometimes isn't enough room on the belt for the same number of items. It's a very strange situation, but I've tried a workaround in v1.5.20. Ah well if the connected belt pushes items into the loader, there would be no space left. Try to check if room for placement else void. steinio wrote: Ah well if the connected belt pushes items into the loader, there would be no space left. In v1.5.20, it tries to put any excess items into the player's inventory. If there's no room in the player inventory, the items are spilled on the ground at the player's feet. I tried now with the latest update to upgrade miniloader -> fast miniloader, but the upgraded miniloader disappears. I can't find the miniloader in my inventory. If I deconstruct multiple filter miniloaders using the deconstruction planner and bots, I don't always get all of them back. For example, I'd deconstruct 27 of them, and get only 22 back. I'd deconstruct 16, and get only 10 back. It's not that I get other items back instead (as far as I have noticed), the filter miniloaders just go up in a puff of smoke, it seems. Is that a bug in the mod? Is it solvable? I've been able to repro this in an old vanilla save by reloading it with the miniloaders mod, and it also happens in my BobAngel game with lots of mods. Using Miniloader 1.5.20 and Factorio 0.16.43. I have a good idea what the problem is and a fix should be available once I get some free time. v1.5.21 is now available, which should resolve the issues with Upgrade Planner and Ultimate Belts not always returning a miniloader item when mining or upgrading. Hello. Can i suggest direction control function for circuit network? Use signals to reverse loader? ReasonX wrote: Hello. Can i suggest direction control function for circuit network? Use signals to reverse loader? Interesting idea. Could probably be done, but might be somewhat costly in terms of UPS. How responsive would you need them to be? Would it be okay if the signal changed, but the loader direction didn't change for a few seconds? Therax wrote: but the loader direction didn't change for a few seconds?